North Technology Group has a long and deep shared history with the America’s Cup. Both North Sails and Southern Spars have been integral to development of the yachts on the water over many years, most recently with the introduction of North’s revolutionary 3Di sail technology and then the innovative fixed wing foiling catamarans. The recent announcement of the new boat concept for the 36th America’s Cup owes much to the hard work, resources, expertise and creativity at the heart of the North Group. North Sails and their design tools were once again an integral part of the vision for high speed foiling monohulls with a soft wing to be raced in New Zealand in 2021. Emirates Team New Zealand and Luna Rossa Challenge knew they wanted to create something new, exciting and different when they reclaimed the America’s Cup in Bermuda, setting the stage for their defense in Auckland. 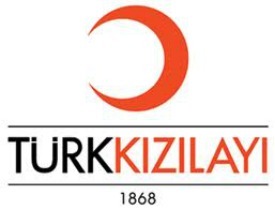 They turned to North Sails, the undisputed world leader in sailmaking. For over 30 years, North has developed the North Design Suite, a powerful and diverse spectrum of design software, which has become trusted by naval architects, designers and racers the world over. 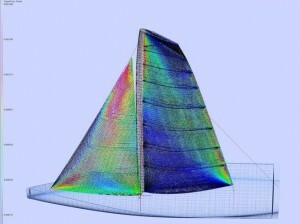 From the early stages of the collaboration back in September 2017, North Sails senior design experts Burns Fallow and Michael Richelsen knew that the North Sails patented Membrain software, which balances wind pressure, sail shape and rig forces, would be a critical element to developing a new boat concept including the soft wing. North Sails Senior Sail Designer Burns Fallow: “We started this project in September and we did not have a lot of time to figure out if this big idea was to be feasible or not, and there were some big questions to be answered. Questions like, how much are the loads shared between the windward and leeward sail skin? How will the batten/mast interaction work, and how much aerodynamic benefit will there be from this? Membrain uses data from the wider suite of North design software to deform the rig/sail combination as a unified structure. As structure is deformed, the shape of the sail changes, and Membrain pushes the data back through the other North software programs, most notably Flow (which applies wind pressure to sail surface and calculates the forces created), to acquire updated pressure field data. The process revises the sail shape in Membrain in a circular feedback loop until a stable balance is achieved. The two-element slotted hard wing used in the 34th and 35th America’s Cup [2013, 2017] provided the ultimate trimability, allowing trimmers to literally dial in any shape short of breaking the equipment. 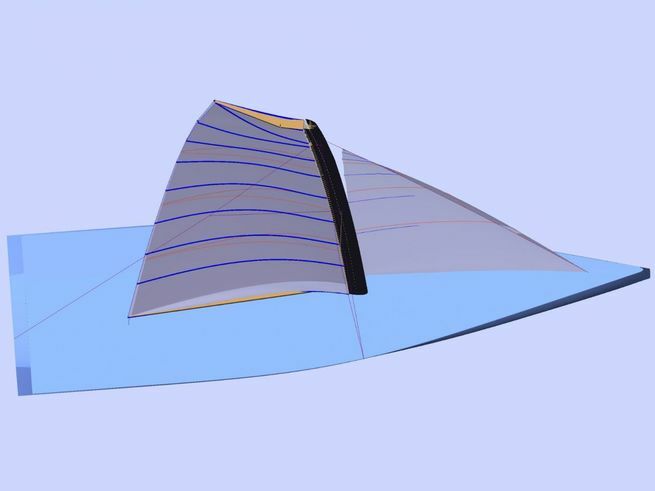 A slotted wing can be set with deeper cambers than a conventional soft sail, reaching a higher Maximum Lift Force. Secondly, the rigid control arms can force inversion of the upper sections, which creates righting moment by reversing the lift force. But a hard wing is complicated, expensive, and impractical for sailing in general. By inverting the upper wing, the sail/wing is actually pushing backwards. It is also pushing to windward, reducing the sail’s tendency to heel the boat. The balance of the inversion and normal camber can in some conditions increase the boat’s performance. The soft wing is a hybrid between a conventional sail and hard wing. Pairwise battens (one in each section) actively control twist in the head area. The control of these battens can change the sail shape and thus performance. 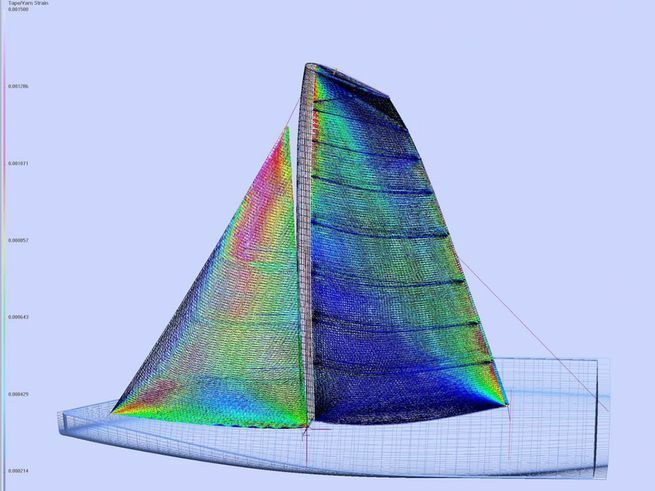 Though the section inversion of a soft wing cannot be as dramatic as it would be on a hard wing, the soft wing inverts much more than a conventional mainsail. Much of North’s recent development in Membrain has focused on modeling the interaction between the pairwise battens. Unlike a conventional mainsail, a hard wing does not backwind when the traveler is moved down or the sail is twisted. The soft wing inherits this feature, thanks to the pairwise battens, so a soft wing can be de-powered more than a conventional sail. This has proven to be a beneficial and widely used feature. North 3Di skins act as essential load carriers, joining together with the pairwise battens to make an effective soft wing.